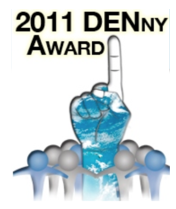 With the certainty of sunrise and sunset, I know that on April 17, 2012, I will begin my journey to remission via chemotherapy. While doctors suggest that there is no connection between my wrist surgery and a cancer flare, I am not a believer in coincidence (read too many John Corey novels). Cancer spike and surgery--a definite link. With a clock counting down to C-day, I have been getting my life in order on the possibility that the experience won't be a good one. And I've begun to realize just how large my life really is, how much there is to get in order, even in retirement (which btw has been a good busy). When I was diagnosed with Non-Hodgkins Lymphoma 3 years ago, I began in earnest moving toward organic living (again), something I had dallied with throughout my life. We live on a farm so every decision impacts the land and neighbors in our distant periphery. I began studying the toxicity in our life choices at every level and then returned to tried-and-true standards from the inside out. 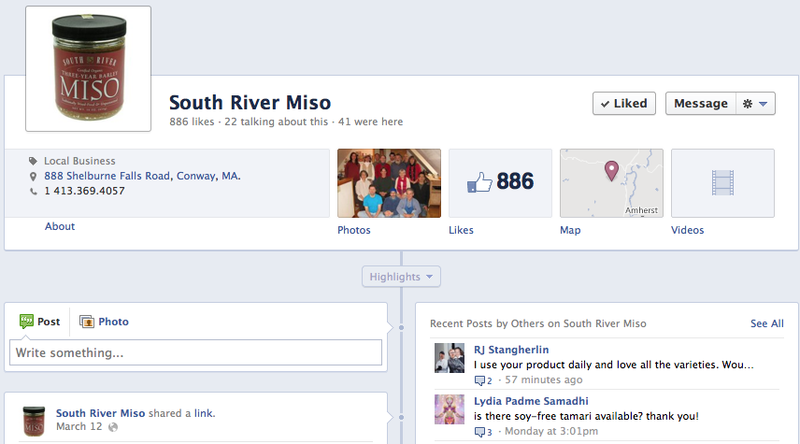 South River Miso has been a part of my life (almost) since their beginning. Found them in my then favorite health food store and never looked back. Buying all of their products, I can guarantee that their products are wonderful, organic, and healthy. 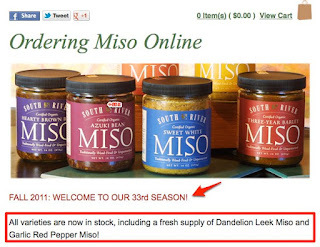 While you can cook with them, and I do, I also enjoy drinking them as an AM hot beverage or a PM pick-me-up. 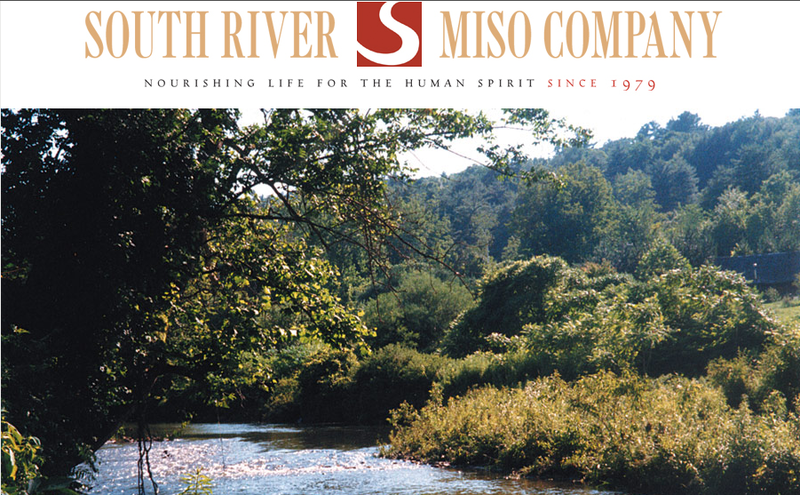 What I love about South River Miso is a company with roots to the land and their philosophy of manufacturing their product. Their ecological footprint shows a wisdom in land sustainability. A self-contained business that begins, grows, matures, and is harvested on their farm has endured and thrived for 33 years with consistency in product output. AND THEY ARE CERTIFIED ORGANIC! 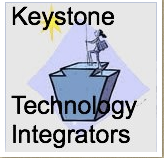 But what I truly admire beyond all of the above is their smart use of social media. You can find them on Facebook, Twitter (@southrivermiso), and YouTube. 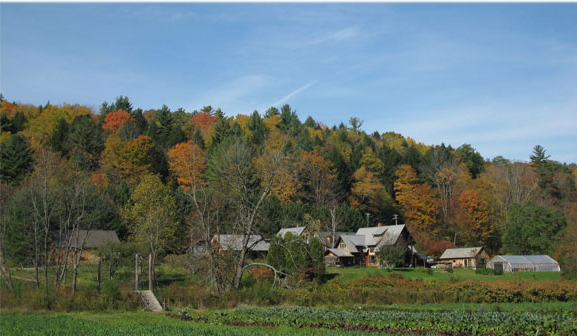 Martha Stewart took a field trip to SRM in 2001 and remarked that stepping foot onto their land was like stepping into another world in another time. See if you agree. You can watch and learn from their Rice Planting at South River Series. Here's the first in the series. For the rice in flower, watch this video. Harvesting the rice is a fascinating video. You could spend hours watching the series of videos related to the production of South River Miso, and admittedly I have skimmed over the process, but I heartily encourage you to watch the videos on their channel. So, by the post's title, you may be wondering if there is a connection to beating back cancer with miso. The research is certainly not conclusive (but suggestive), nor am I promoting that using it will cure any cancer. But what I AM supporting is simple: chemotherapy robs your body of just about everything, or so I have heard from friends who have survived treatment. Putting something as wholesome as South River Miso in your body during before, during, and after this time is definitely helpful. I will continue to monitor and write about my journey, but I can tell you now that SRM will be an integral part of my life and I wouldn't have it any other way.